However, we didn’t have any Parmesan. We usually don’t have ANY cheese in the fridge. I’m lactose-intolerant for the most part with the exception of little bits of goat cheese and butter. To make matters worse, I LOVE cheese. So, having cheese in our fridge would be akin to torture for me. And when I do have any substantial amounts of cheese, it better be worth it. But for reasons too long to explain, we had Gruyère, Havarti, and Cheddar in our fridge. If dark chocolate pairs well with parmesan, why not with other types of cheese? I decided to put that to the test by making grilled cheese with the existing cheese I had in the fridge. It is grilled cheese month after all. Gruyère, Havarti, and Cheddar are all great melting, grilling, ooey, gooey, yummy cheese – albeit they aren’t as salty as Parmesan. That’s nothing a little bit of Fleur de Sel can’t fix. And I’m a dark chocolate addict. So I really can’t ask for more than this combo of goodness. But I decided to add some strawberry dipping sauce to the mix, since chocolate and strawberries go so well together. Admittedly, I was a little skeptical before I took the first bite. 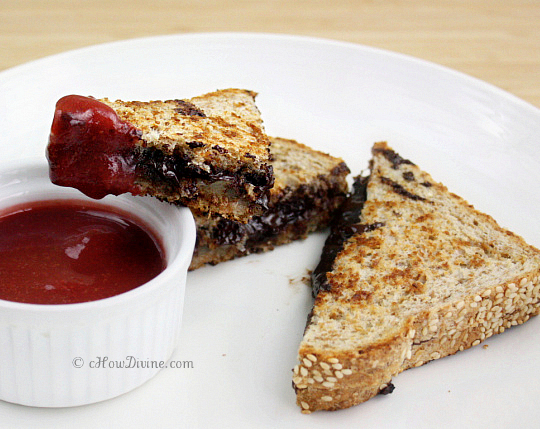 I never really considered using dark chocolate in grilled cheese sandwiches before. But I am a total convert. It was amazing – especially dipped in strawberry sauce. And predictably, it was delectable with a glass of Champagne. Any sparkling wine will do – Champagne, Prosecco, or Cava. You know what? It WAS worth it. And I never felt so fancy eating a grilled cheese sandwich before! Note: If you just have one or two types of cheese, just use what you have. In fact – if you have Parmesan – by all means use it. It may taste even better. Just slice them thinly and follow the recipe. Additionally, you can use less (or more) cheese if you’d like. Place strawberries, apple juice/dessert wine, and 1 TB agave nectar (or honey or maple syrup) in a blender. Blend until few small lumps of strawberries pieces are left. If you don’t like the seeds, you can blend the mixture until smooth. Pour the contents in a small saucepan and simmer until the sauce reduces and thickens. Remove from heat and set aside. Spread a dab of butter (optional) on one side of both slices of bread. Heat a cast iron skillet or other heavy bottomed pan on medium heat. Place one of the bread slices on the pan, buttered side down. Place a slice of Gruyère, Havarti, and Cheddar on the bread. Add chopped dark chocolate on top of the cheese slices. Make sure to place the chocolate in the middle. It will spread out as it melts and absorb nicely into the bread. If it’s too close to the edges, it will melt down the sides and make a mess. Sprinkle some Fleurs de sel on the chocolate. Place the second slice of bread on top of the chocolate, buttered side up. As the cheese and the chocolate melts, gently press down on the sandwich. 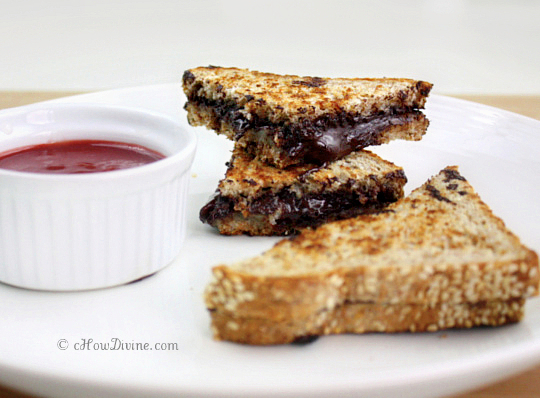 Unlike your average grilled cheese, the melted chocolate will ooze out the side if you press to hard. Allow the chocolate to absorb into the bread. Let the sandwich lightly brown on each side – about 3 to 4 minutes on each side. Remove from heat and let it sit for about a minute for the cheese and the dark chocolate to set/incorporate. Serve with strawberry dipping sauce… and champagne if you like! I think you’re going to be my new best friend. Chocolate and cheese? And grilled together? That’s a party. You’re so going on my “inspiration” list! Two thumbs up for originality! But would you call this lunch or dessert? Wow chocolate and cheese..looks irreristible! Thanks Kavita! I wasn’t sure about it until I tasted it. But when I did, I wanted more. It was so delicious! 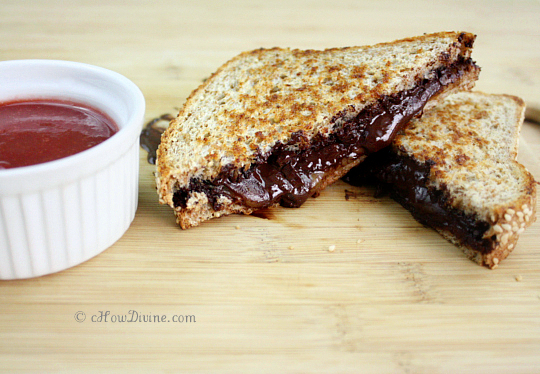 wow this grilled cheese and chocolate sandwich looks really delish! I’ve actually never had anything close to this but I am drooling just by looking at that melting cheese and chocolate sandwiched in those buffer tasted slices. This will be my next party dish for sure! Thanks. You’re always so sweet! Yeah, this was surprisingly good. Although, they (chocolate & cheese) are both so tasty separately that there really isn’t a reason why they shouldn’t taste amazingly together! Wow lovely recipe… Looks very delicious!! !